대방광불원각수다라요의경은 줄여서 ‘원각경’이라고 부르기도 하며, 우리나라 승려들의 교과과목으로 채택되어 불교 수행의 길잡이 구실을 하는 경전이다. 우리나라에서는 고려의 지눌이 깊이 신봉하여 ‘요의경’이라고 한 뒤 크게 유행하였다. 이 책은『원각경』에 당나라 종밀(宗密)이 주석을 붙인 것으로, 권 하의 두 번째 책이다. 목판에 새겨 닥종이에 찍은 것을 호접장(胡蝶裝)으로 만들었으며, 크기는 세로 34㎝, 가로 19.8㎝이다. 호접장이란 찍어낸 책장을 글씨가 안으로 오도록 반으로 접어 겹겹이 포개고, 접혀진 부분의 바깥쪽에 풀을 칠한 후 표지를 붙인 책의 형태를 말한다. 고려 문종 때 여러 스님들이 저술한 문헌들을 총망라하여 간행한 속장경계열의 짜임새를 지니고 있으며, 판을 새긴 기법이나 글자체가『대방광불화엄경소』(보물 제891호)와 비슷하고 다시 새긴 특징이 있다. 이 책은 송나라 판본을 입수하여 새긴 고려시대 판본으로 보이며 인쇄상태로 보아 한번 찍어낸 목판에서 다시 찍은 후쇄본으로 추정된다. 이 책이 발견됨으로써 속장경계열의 원각경소가 전부 갖추어지게 되었으며, 보기 드문 호접장본으로서 귀중한 자료이다. 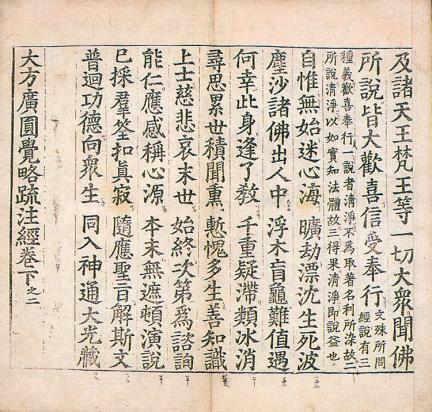 Daebanggwangbul wongaksudara youigyeong (Mahavaipulya purnabudha Sutra) is also called Wongakgyeong for short. Adopted as one of the teaching subjects for Korean monks, it is used as a guide in Buddhist training. It became popular in Korea after Buddhist Monk Jinul of the Goryeo Dynasty recommended the book. 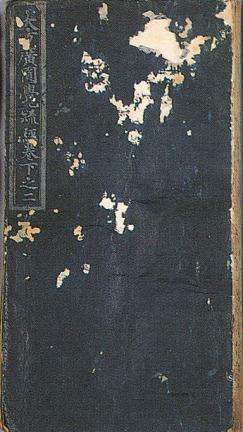 As the 2nd volume of Wongakgyeong with annotations by Monk Jongmil of the Tang Dynasty, it was engraved on wood blocks, printed on mulberry paper, and stitched together in the form of hojeopjang binding. It measures 34cm long and 19.8cm wide. Hojeopjang is a form of book binding that folds each printed page in half so that the printed sides face each other, applies glue to the outside of the folded page, and finally attaches a cover as a finishing touch. It has the structure of Sokjanggyeong, which was published after collecting all literatures written by many monks during the reign of King Munjong of the Goryeo Dynasty. The technique of engraving boards and the style of letters are similar to those of the Commentary on the Avatamsaka Sutra (Flower Garland Sutra) (Treasure No. 891), and it has a special feature of having been engraved again. 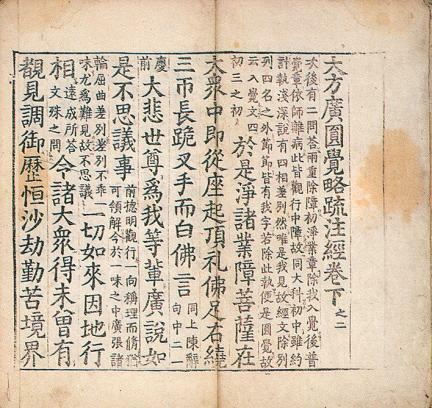 This book is presumed to be a wood block-printed book published during the Goryeo Dynasty by engraving wood blocks after obtaining a copy of the wood block-printed book from the Song Dynasty of China. Based on the printing state, it seems to be a later copy of the wood block-printed book. With the discovery of this book, the entire Wongakgyeong of Sokjanggyeong, a wood block-printed Buddhist scripture, was completed. It is considered a precious material since it is made in a rare hojeopjang style.